Google Instant Mix Just Got Better, But Is It A Genius? 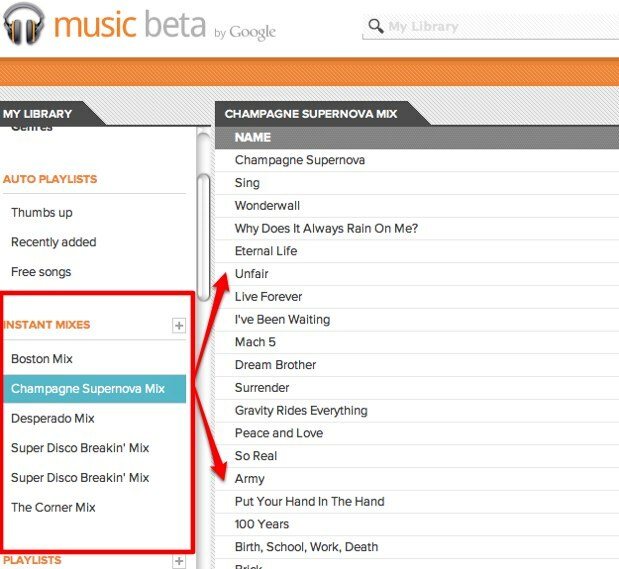 Google announced its new beta music service, “Google Music”, at I/O 2011 last month. The service, as it stands right now, is basically just cloud storage for all your music files that users can access through the web app. Users can stream their cloud-based music libraries to any device via a web browser. It even technically works on iOS, though the experience (especially on Safari) is pretty clunky. It’s also still missing discovery and purchasing power, though there’s no doubt that these features are on the way. After all, this is Google, and iTunes is heading to the iCloud. In the meantime, Google is quietly unveiling the features to its music service, building a full-scale iTunes competitor piece-by-piece (or maybe hastily, it depends who you ask). And yesterday, Google Research officially congratulated itself for making some drastic improvements to “Instant Mix” — the playlist generator that is getting closer to being Google’s equivalent of iTunes Genius. In essence, Instant Mix is a playlist generator that uses machine hearing to extract attributes from audio which can be used to answer pointed questions about songs, like, “Is this a song I can blog to?” or “Does it have blues guitar?” Not unlike Pandora’s Music Genome in intention, Instant Mix analyzes particular attributes of a song, using its algorithms to compare audio data to information pulled from the Web. Google has done some serious research in the emerging field of machine hearing, which endeavors to teach computers to better process information from audio sources, and it’s beginning to show. With the combination of this audio analysis and web-crawled artist data, Instant Mix is able to compare songs that are similar in nature and work well together in a playlist. If you pick a quiet song while you’re working, the service will create a quiet playlist for you from your music library. For those not yet tapped into Music Beta, you can go to Google Research’s blog to check out a few sample playlists. At I/O, Google’s Paul Joyce said that Instant Mix is meant to be one of the new music service’s “killer features”. But, is it? Erick Schonfeld and John Biggs demo-ed Google Music and Instant Mix a few weeks ago and found the service to be pretty hit-or-miss. After Google Music’s launch, Echo Nest’s Paul Lamere did a deep dive into the comparisons between Instant Mix, iTunes Genius, and Echo Nest and found Instant Mix to be way behind the other two in terms of serving too many “WTFs” — songs that are glaringly dissimilar from the song you choose as the jumping off point for your playlist. Google has since made several upgrades to the service, and it now works far better than it did at launch. It’s great to see how quickly Google was able to iron out the kinks. And, last I checked (iTunes disabled my account because someone hacked it), Genius takes awhile to incorporate newly downloaded songs into playlists, and whether or not Google Instant Mix intends to or not, it has been previously offering more of a “surprise” factor. For some people, this will actually be a pleasure. If you have a large collection of music, it’s nice to be reminded of a song you may not have played in awhile. Of course, it would be nice for Google to be a little more open about whether this is something they intend, or whether it just shows that the feature has been relatively half-baked. I’d like to see both iTunes and Google Music offering some user options in terms of how your playlist is created. One option could be more random, incorporating more surprise, while another might only create playlists of similar songs based on mood, and so on. What’s more, how about an evolving playlist mechanism that allows contextual updating, so that a playlist adjusts slightly to each new song, maybe pulling in different songs as it goes? Now that would be genius. Mensa level even. It will be very interesting to see which combination of algorithms wins out. Does Google’s collaborative filtering mixed with acoustic similarity data offer a better alternative to iTunes’ collaborative filtering algorithm driven from purchase data acquired via the iTunes music store? Granted, these services are both essentially black box, so I’m glossing over a bit in terms of what I’m sure is more complicated, double secret mechanics on both ends, but it’s always interesting to see what combination of algorithms and data end up serving the best playlists — and recommendations, for that matter. We can always use more transparency from algorithmic recommendation systems, so it’s good to see Google peeling back the curtain a bit on Instant Mix. Once discovery and purchasing hit Google Music, we may have one great service on our hands. Until then, I’d say Instant Mix is close, but not quite there.